Genre-bending trailblazers Rumble Gums celebrate debut album, Pool Party Palace. Friday, Aug. 12, 8 p.m. I'm only five songs into Rumble Gums' debut album Pool Party Palace (RumbleGums.Bandcamp.com), and my mind is rapidly trying to make sense of their vast repertoire of musical influences. Songs like "Green Machine" sound like they would be at home on one of Mike Patton's side projects, while vocalists Kleber Alor and Nollo on "We Shall See" shift the trajectory into the realm of hip-hop and funk. It's not until I hit the final, synthed-out cataclysm of "Code/Invalid" that I realize the common thread throughout these 15 songs is the simple fact that the band is having a really great time. A day later, I'm sitting at a cluster of repurposed elementary school desks at Publik Coffee, chatting with frontman Chase Cee. Tall, bearded and sporting an epic man-bun, Cee is excited to talk about Rumble Gums, the band he founded six years ago with guitarist Davey Nelson while cutting high school classes and listening to electronic music. Cee's enthusiasm for the band—all things creative, really—is palpable as he tells how his and Nelson's contrasting musical backgrounds battled it out until the core of the band's unique sound emerged. "It's kind of like me versus Davey—in a good way," Cee says. "If Davey had his way all the time, it would be purely rock 'n' roll. If I had my way all the time, it would be mostly electronic beats." It's a process that appears to be working—Cee's heavy, bass-centric beats create a broad canvas that displays the nuances of Nelson's ambling guitar chords. The adaptive and fluid musical ecosystem that Cee and Nelson have created in Cee's studio lends itself to collaborations that feel natural, despite their different points of origin. And, since they write in the studio, a song's sound is often determined by who's present, and what they can add to it. "That's where all the weird influences come from," Cee says. It was only two years ago, however, that they realized they'd written enough songs for an album. Cee and Nelson produced the band's foundational arsenal of songs together within the confines of Cee's home studio. Cee says they "just went at it for a while" until the project got too big for two guys. They decided to mobilize. Taking the auditory onslaught of Rumble Gums on tour required more hands on deck. They looked to recruit artists who had the creative chops to interpret the style that Cee and Nelson had created and translate it into live music. They enlisted drummer Jimmy Buonforte, who Cee says "heard the music and was the catalyst" to taking Rumble Gums from the studio to the stage. They also recruited keyboardist Spenny Relyea (formerly of The North Valley) and bassist Johnny De La Torre and local comedian Jackson Banks on vocals and "antics." Their first tour was amazing, according to Cee, and took the band through San Francisco, Seattle and Portland. Rumble Gums is keen to rekindle that road magic and take PPP to the people. They're justifiably proud of the album, a testament to the power of self-publishing and producing. 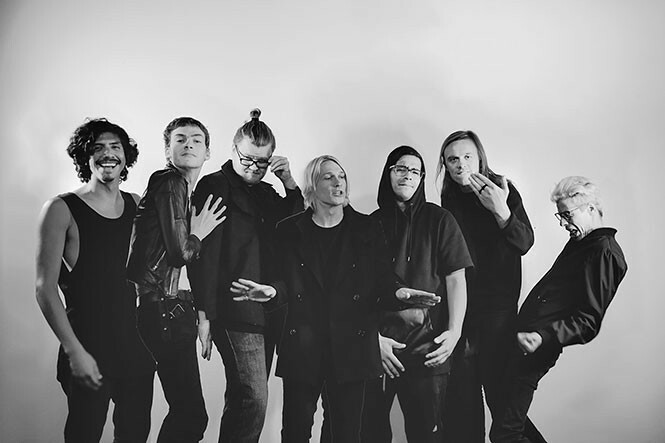 The pair wrote, recorded and performed all 15 songs (with contributions from Banks, Alor, Nollo and Madelyne Boyer), and photographed the circular panoply of food for the album cover. "It's interesting to do all of the ... work ourselves," Cee says. "It's liberating."